A few weeks ago I met a patient who came to see me for treatment recommendations for a desmoid tumor in her hip. She is a healthy, 40 year old female who noticed that something was wrong after slowly developing more pain and discomfort during hiking and other physical activity a couple years ago. She had seen a surgeon after an MRI revealed a grapefruit-sized, hazy tumor over the outside of her left hip. After a biopsy revealed the diagnosis, she underwent surgery with complete removal of the tumor. However, it recurred within a relatively short time, about a year or so. 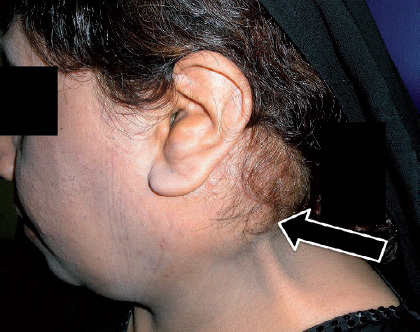 The surgeon began to treat her with anti-hormonal therapy, tamoxifen, and when the desmoid continued to grow a few months later, he added an anti-inflammatory called sulindac or Mobic. Finally, he even added oral chemotherapy, a drug called imatinib. When she continued to have pain, he started to discuss repeat attempts at surgery, although he warned her she was at risk of requiring a hemi-pelvectomy (removal of the bone making up one side of the pelvis) or even amputation of her leg in the future. Fortunately, he also referred her to medical oncology to come and talk about whether there might be anything else we could offer. After I met her and went through some of the various treatment options and new therapies being studied for treatment of desmoids, she burst into tears, saying that she had been completely convinced her only option was an amputation, and that she would never hike or even walk again. Needless to say, I was pretty upset at the amount of anxiety and turmoil that this patient went through, especially since I had just gotten back from the Desmoid Tumor Research Foundation conference. So, I decided that I would post an update and summary on current treatment options for desmoids, in case there are any other patients who have been told that aggressive surgeries may be the best (or only) option for their disease. First, what is a desmoid? It’s named after the Greek desmos, which means a band or connection. These tumors resemble overgrown scars and have tremendous amounts of collagen, the protein that gives strength to our tendons and ligaments. These tumors are not malignant cancers, meaning that they do not spread or metastasize. However, like the patient I described, some of these desmoids can be recurrent and stubborn, and can occur in very problematic locations, like the joints, around major nerves and vessels, or inside the abdomen where they envelop the bowels and other organs. Repeated attempts at surgery to the area can lead to significant pain, problems with joint function, deformity, and poor quality of life, even though this is not a cancer! What is equally fascinating is that other desmoids, when left alone and monitored closely, have the ability to disappear over time. Some are related to hormone exposure, and discontinuation of high-hormone situations, like pregnancy, or stopping oral contraceptives or post-menopausal hormones can lead to resolution. The other common story for patients with desmoids is development of the tumor in a preexisting scar from another surgery. Desmoids are rare – 1 or 2 in a million patients, tending to affect young and healthy people. They sometimes occur in an inherited cancer syndrome called Gardner’s syndrome or familial adenomatosis polyposis, which leads to colon cancers at a very young age in addition to desmoids. Why do they develop? We now know that most desmoids arise from a defect in one of the wound-healing pathways, including important proteins known as Wnt, NOTCH1, beta-catenin, and APC. While desmoids associated with Gardner’s syndrome develop because of the inherited mutation in APC that is passed down in the family, almost all sporadic desmoids have one of four spontaneous mutations in beta-catenin. Although we don’t understand why this abnormal mutation happens, it makes sense why repeated surgeries on desmoids often lead to recurrence. Basically, the process of surgery stimulates wound-healing, including beta-catenin production, and any living desmoid cells left behind might be prone to regrow. So how do we treat desmoid tumors? There are a few considerations right off the bat. First, is the desmoid causing any problems or symptoms – pain, problems with range of motion, or is it in an area where if it gets bigger it will lead to damage to surrounding structures? If the answer is no, the standard recommendations now are to watch and wait – up to 20-30% of desmoids will resolve spontaneously for unknown reasons. Additionally, up to 50% of patients will have their desmoid stop growing and be the same size for up to 5 years! Unnecessary hormone exposure should be discontinued, and some patients may opt for hormone-blocking therapies – like tamoxifen. If the desmoid occurs in a pregnant patient, often it will go away after the mother delivers the baby and estrogen levels return to normal. Also, anti-inflammatory medications like Celebrex or Mobic may be used, sine their anti-inflammatory properties may help to block the wound-healing cascade. It’s important to note that anti-hormonal therapy or anti-inflammatories are unlikely to shrink existing desmoids – but they sometimes will keep them from growing. The mild side effects make these treatments a good option for patients who do not have symptoms, but aren’t comfortable with the “watch and wait” approach. At the other extreme are patients who are extremely symptomatic, or the desmoid has recurred or grown despite more modest therapies, or it’s in a location where we just really need to shrink it before bad problems occur. 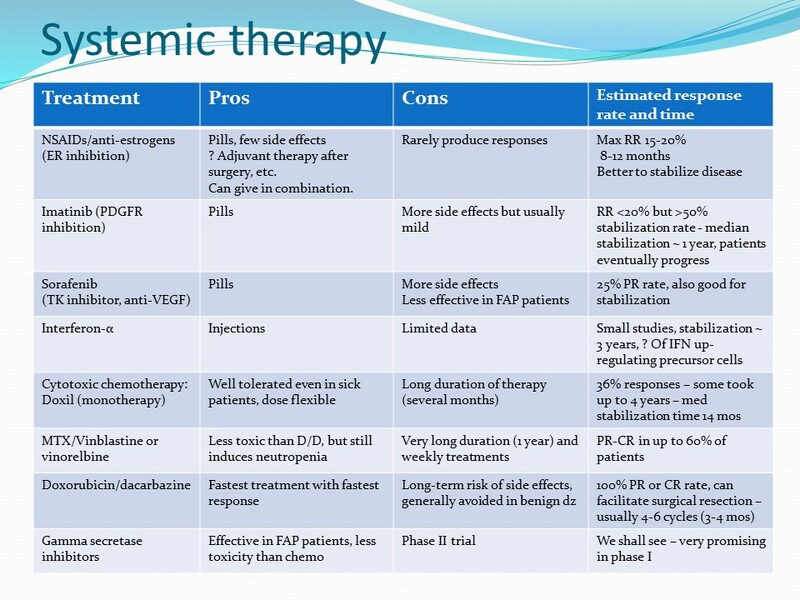 In these cases, the treatment with the highest chance of shrinking the desmoid is chemotherapy – either a combination of vinblastine/methotrexate, which involves weekly or biweekly treatment for a year, or doxorubicin/dacarbazine therapy which is more intense but can produce responses within 4-5 months. Chemotherapy obviously carries significant risks and side effects, and many people shy away from chemotherapy for a “benign disease.” However, with a very symptomatic desmoid without other treatment options, or where the only option is a morbid surgery, chemotherapy can be extremely effective and worth considering. In the middle of these two extremes fall some newer therapies. These treatment options split the difference – they are a bit less likely to produce shrinkage than the more aggressive chemotherapies, however they have fewer side effects. They also need longer before you might start to see results. Two chemotherapy pills that are being used include imatinib (or Gleevec), and sorafenib (Nexavar). Sorafenib is currently being tested in a large phase III clinical trial with the goal of making it an approved therapy for desmoid tumors. Gleevec has been used for years, and although it is somewhat less effective than other therapies, it generally is well tolerated and can often produce at least stabilization of the desmoids. Finally, another option I often will recommend is doxorubicin chemotherapy in a special packaging, called liposomal doxorubicin or Doxil. This generally has better side effects than traditional chemotherapy, and is a once-a-month infusion. Some people prefer the convenience of once a month dosing as opposed to needing to take chemo pills every day. For all these intermediate therapies, I don’t even check scans for at least 3-4 months as it will take that long for the desmoid to start to change size. However, pain relief can occur within the first few weeks. Like other sarcomas, desmoids tend not to shrink in size – at least not right away. Most clinical trials that evaluate new drugs for cancer look at the change in the maximum dimension of the tumor, and there needs to be a 25% decrease to call the tumor a “partial response.” If a drug only produces stable disease or the tumors increase in size, that can be enough to stop further development of these drugs which might be very useful! However, measuring pain or function results is challenging in trials because of bias, and the FDA has not yet bought into non-traditional tools that suggest response instead of size-based criteria. For example, presented at the Desmoid Tumor Research Foundation 2015 Workshop were the results of a new study of a drug called a gamma secretase inhibitor for desmoids. These drugs block the action of NOTCH, which leads to downstream activity of the Wnt pathway. Only one of the 17 patients on the study had a partial response. However, when they used MRI to calculate three-dimensional volumes of the tumors, the volume decreased in 16 out of the 17 patients! Additionally, only one patient actually had progression; the rest had “stable disease” and were able to remain on the drug for months to years! So, an incredibly important area for research is determining how to create a new system for measuring response in desmoids, that is not just related to one-dimensional size. Another area of interest is looking at whether we can predict how the desmoid is likely to respond to treatment based on the particular mutation in the beta-catenin protein. Many studies (although not all) have suggested that a mutation at the S45F spot in the beta-catenin gene leads to increased resistance against milder hormonal and anti-inflammatory therapies, and may be more likely to recur after surgery than some of the other mutations that can be found. If this is true, it might suggest that patients with S45F desmoids should be treated earlier with more aggressive chemotherapy instead of the watch and wait or tamoxifen/sulindac strategy. Thus, another area of research is focused on determining whether the specific mutation can be used to guide therapy, which would help us personalize treatment for our desmoid patients. Finally, what do you do if you are able to get the desmoid to shrink using one of these methods? One option is to watch, and hope that whatever treatment you used has stunned the desmoid enough to send it back along the road to shrinkage on its own – we often see that the desmoid continues to shrink even months after stopping treatment. Another option is to try to do something else to the tumor to consolidate the treatment. You could consider surgery, radiation, or other new techniques called ablations. Ablation involves freezing, burning, or electroporation (poking tiny holes in desmoids and using electricity to kill them). These are less invasive but only time will tell if they are less prone to stimulating the wound-healing cascade that is thought to lead to recurrence. After much discussion, my patient and I decided to try sorafenib to help her symptoms and avoid using chemotherapy. In my clinic I’m currently treating an 18 year old high school student with chemotherapy after he has had a bothersome desmoid at his ankle which keeps him from wearing shoes. And I have several patients who have successfully been able to shrink their desmoids with Doxil, without major side effects. The take-home point is that there are options apart from surgery that may be right for you, and it’s important to be fully counseled before you commit to an aggressive surgical procedure that may or may not produce a cure. Clinical Trials: What you should know to make an informed choice about your therapy. Thank you for taking the time to write such an informative article. My sister has developed a desmoid tumor and this article ia really helpful for our family to see what options are out there for treatment. You are an angel – thank you for doing what you do! Thanks so much!!! Glad it could help! I’m currently on chemotherapy for my desmoid. Methotrexate/vinblastine combo. I have 3 more treatments to go and so far the tumour has shrunk about 60% in size and my oncologist is happy! My only worry now is that after I stop that it starts growing again. And if it does, what next? The thought of going back on chemo honestly makes me want to escape my own body. Maybe I’m getting paranoid for no reason and the treatment will work, but at the same time I want to be mentally prepared and knowledgable about a Plan B. If it can’t be operated on, it’s in my chest wrapped around my second rib, and chemo doesn’t work then what else is there to consider? My oncologist said I’d need to go back on another round of chemo. But, really? I’m sorry for delay in responding- I can’t really weigh in on your situation without seeing you or your scans- not all Desmoids are the same. Hello, and thank you for writing an article that actually has some useful information in it. I was hoping if you can help me… I am 28 years old and after delivering my first baby I noticed a huge lump on my right hip. It was the size of a grapefruit and after a core needle biopsy they told me it was a desmoid tumor. After doing the wait and watch approach for 9 months (in which I was breasfeeding during the time) the tumor grew in size and my oncologist recommended surgery. After surgical removal of the tumor with negative margins, 3 months later it was back again and in the same area but this time 3 small locations. This time my oncologist said that surgery would not be a good idea because of the location of the tumor and that it would cause me to be walking with a limp, cutting my muscles and other problems. So he said I should get radiation treatments. I went for 30 treatments of radiation, and it will be one year in December since my treatments. So far I have been to two follow up MRI’s and the tumor has not changed in size (thank god) but it hasn’t shrunk either…I have taken sulindac in the past but stopped taking it and now am taking some herbal pills from my acupuncturist. I had a very important question, which I feel like no one can answer. Do you think if I try to get pregnant again the tumor might start growing again. Will my second pregnancy effect the tumor that is still in my hip? I really hope you have an answer for me. Thank you so much in advance. Hi and thanks for your email- key is that size doesn’t matter in Desmoid- the MRI needs to be reviewed for enhancement which suggests whether the tumor has completely turned into scar now. Hopefully they did MRI with contrast! If NO enhancement I think the chance of regrowing with pregnancy likely low (though not zero)- if there is still residual living tumor the chance might be higher. Can’t provide any definitive advice without seeing you and reviewing your scans but I hope that helps somewhat. Hello Dr. My 40-year-old daughter has FAP and an intra-abdominal 15cm desmoid. I am very depressed because she has been telling me that her no one in her desmoid support group has had shrinkage from chemo. My daughter is too afraid to have surgery. I hope that you take Tricare Standard insurance and will be able to see her. Thank you. A very worried mom. Thank you for your article. This is so informative. Does it take very long to get an appt. with you? I live in California, but I am willing to go wherever I need to for the right treatment. I am interested in getting advice from you on an abdominal tumor I’ve recently been diagnosed with. I’ve had zero treatment so far. Hi. I’m generally fit and healthy.34 YO.2 years ago I delivered my 1st son through an emergency c-section.Soon after it I realised a hard ball right under my rib cage,but I thought it was just a muscle displaced due to my enormous pregnancy belly and thought no more of it.I am now 16weeks pregnant,recently had the lump checked and it has been diagnosed as a 4cm desmoid tumor located in the abdominal wall.My oncologists seems quite calmed about the whole situation and advises to keep a vigilant eye on it,without further checks until March. I am just a bit nervous,cannot help it but thinking this may put my pregnancy in jeopardy. Would you be able to recomend studies,conferences or any reputable bibliography where I could get some more understanding,thus comfort that it all will be fine?Thanks in advance for any assistance you may provide. hello, I know it’s scary – but many times these will improve after you deliver the baby and the estrogen comes down. 10% will go away on their own, and many more will just remain dormant. if it starts to grow there are MANY options for treatment. We have been able to get some pretty amazing results with ablations, either freezing (cryoablation) or electroporation (electricity)- also called nanoknife here. Could also try the new oral drugs, either imatinib or sorafenib which should be available there, if he hasn’t already. Hi, I am 31 year old female from Ireland, I have Desmoid tumours in my pelvis for 2 years now. I had surgery to remove but they came back. I have been on three different chemotherapy treatments as mentioned in your article but unfortunately unsuccessfully. I would like to get your advice on treatment, I can send over my files or fly for an appointment, I am desperate to get better and possibly have nother baby. Thanks for reaching out, Email me at Breelyn.wilky@ucdenver.edu and I can discuss options for your evaluation- thanks! Thank you for your research! I have sent you an email regarding my case. Thanks for all you do.